Study period: 1991-4. Boston Children's Hospital. n=2698 surgeries (73% on bypass). Overall incidence of AV block was 3% (n=54). Common diagnoses associated with development of AV block were VSD, Tetralogy, LVOTO repair, L-TGA and others. 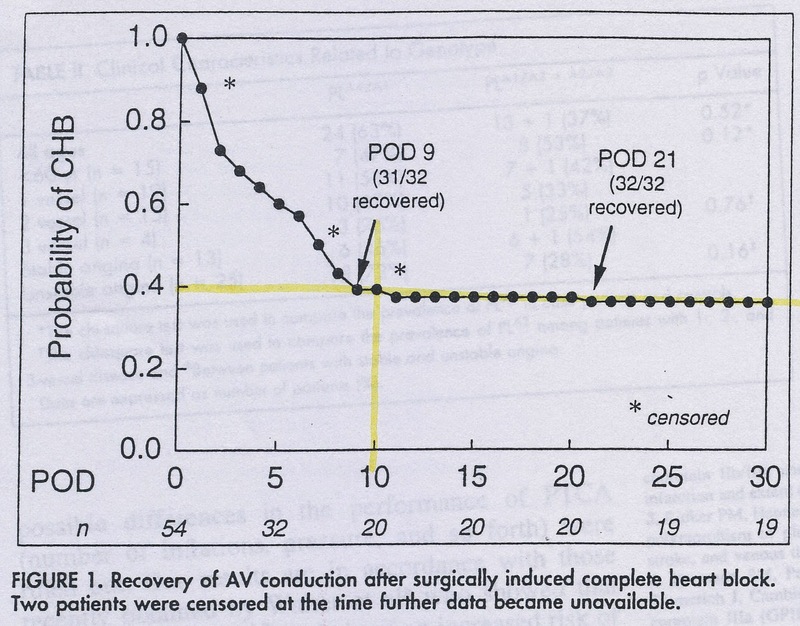 32 recovered conduction in 30 days after surgery (Graph below shows the postop. day at which conduction recovered in these 32 patients). 9 did not recover conduction in 30 days after surgery. Weindling SN., et al. Duration of complete atrioventricular block after congenital heart surgery. Am J Cardiol 1998;82:525-527. ICU: Arterial Line Artifact - "Standing Wave"
Pardon the poor quality images. Upper panel shows arterial pressure traces from 2 different lines - Right radial arterial (Red) and Umbilical arterial lines (White). There is a "standing wave" or "fling" in the red trace. This is secondary to being a small/distal vessel, smaller catheter, and state of peripheral vascular tone (vasoconstricted state). Lower panel shows the same patient, approx. 30 min after the loading dose of Milrinone. Presumably, there is adequate vasodilation of the peripheral artery that the "standing wave" or "fling" is no longer evident or not as prominent as before!